While this series has more "meh" episodes than Part 1, understandably due to the massive 155 episode run, it also has some of the best episodes in the entire series, including two amazing ones directed by Hayao Miyazaki, and also has likely the most tonal variety out of any of the series. There are silly episodes, dramatic ones and downright surreal ones. Something for everyone's tastes. Lots of unique and stylized animation as well that really pops and makes it a joy to watch. And this series was also the first to feature the amazing music of Yuji Ohno, who has composed for nearly every entry in the series ever since. All around an iconic classic that's an anime staple for good reason. Lupin the THIIIIIIIRD! So much fun and humor! Such and amazing series. it's the show that got me started on anime. My brother and I still quote this show from time to time, even 15 years later. Thank you for putting this on Crunchyroll. Lupin the 3rd follows the random adventures of Lupin the 3rd, the greatest international thief on earth and his two on and off again accomplices Jigen, a crack shot pistol marksmen and Goemon, an old school samurai whose sword can cut through anything. They are often foiled/joined by Lupin's love interest Fujiko, who tends to drive him crazy. Like all good thieves, Lupin is often pursued by the law. In this case it is Interpol, and the person obsessed with capturing him is Zenigata, whose father's life goal was to capture Lupin's great grandfather. Zenigata often unwittingly helps Lupin with his heists, which adds to the comedy. The two have a mutual respect for each other that transcends the law and gives the characters depth. It's a mix of old school James Bond with a smattering of Inspector Gadget hijinks. The show and animation is a bit dated, but it grows on your so quickly. You'll be humming the theme song and yelling "Lupin the Thiiiiiiiiiiird!" in no time. Please enjoy! Classic show with likable characters, funny storylines, great music by Yuji Ohno. I started watching it after I already watched "Castle of Cagliostro" and have not been disappointed. Every episode is a new adventure into which Lupin and his gang are drawn into and this is this show's biggest advantage. What can i say about this series, its my favorite Old School Classic series and Red Jacket Part II is finally here on Crunchyroll and its the part that i have the most fondest memories with because of its exposure on Adult Swim, a long time ago. Red Jacket Part 2 Of Lupin the Third is the one i have the fondest memories of, since i seen it before on Adult Swim before it used to air late at nights and it was a very funny English dub, sure they changed some of the dialogue and such but i still find it funny thanks to the voice actors and their incredible work. The Japanese Dub is amazing and it has an amazing cast and its alot of fun. Anyways why is Lupin The Third amazing, here is a few things i will say, Great characters, interactions, personalities, Dynamics, Also action adventure as well, traveling across the world to many different locations, from Miami, Florida, to Europe, Asia and such. The cast is amazing while its manly the Main Five they are all different and not one is alike and sometimes they will have different motives and not. The music is very catchy and very classic it has that charm that not many series has nowadays. I am a Fan of the Classic Old School Series and when i saw Lupin on here i put it first, but thats me. Now about the cast first of is Arsene Lupin III he is the master thief that is awesome, Next we have Daisuke Jigen an awesome Gunslinger and kinda like a Cowboy, Then we have Goemon Ishikawa XIII a cool Samurai, Inspector Koichi Zenigata a bumbling and very awesome Interpol Detective Zenigata who is on the hunt for our awesome Master Thief, and the lovely and beautiful, Gorgeous Fujiko Mine who to me she is the most gorgeous, beautiful woman in anime and animation, but she is a dangerous woman who can double cross you as it has happened with the gang as well as whoever is Lupin's enemy and Zenigata, She is one of the earliest Femme Fatale in anime. Anyways the cast is what also drives this amazing show to me i love them all, and they are called the Main Five. 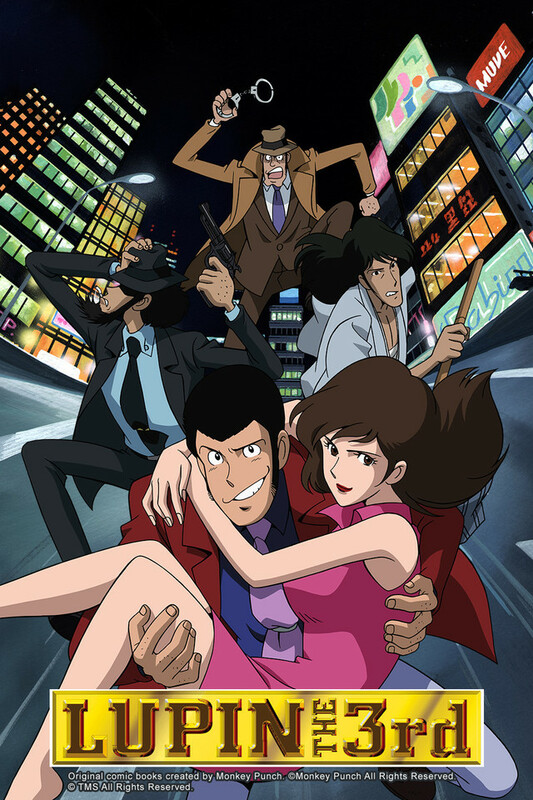 Plus this series has what i consider my favorite anime couple which is Lupin and Fujiko gosh i love them both. A very 1970's vibe that is very fun and adventurous that you will be smiling alot and alot of fun, The Lupin series as whole is a series that always brings me a smile and makes me laugh and enjoy, not many series out there does that to me. Also i was surprised to see the Episodes in English Dub on here which brings alot of awesome memories, but the 1970's art may not be appealing to people, but to me its not a problem i have watched alot of older cartoons in the past especially Inspector Gadget, Disney animated films and animated TV shows so i am used to the Cartoony Style that the Lupin series has which is something i really enjoy of. Lupin to me doesn't resemble anime at all its more like a Western Cartoon which is really cool. I say this if you love fun adventures and while most of the episodes are standalone they range from good to great to awesome. But it all depends if you like this particular style or not? Lupin is alot like Inspector Gadget meets James Bond, Scooby Doo and The Adventures of Tintin in a very cool 1970's way. Part II Red Jacket was the series that introduced me to this wonderful, fantastic and beloved franchise, and it ranks as my top favorite Old School Classic anime series and i don't know i just love it.